– Use one of two Deck Builders. – Use the Deck Template. – Create your own templates in a photo editing program. You can find the Deck Builders in the Modding Tools folder on your computer here. It is VERY important to note that no matter which option you choose, fill up your ENTIRE template before uploading. Regardless if you upload a template with 3 cards on it or 30, it will use up the same amount of RAM. This is a big mistake people make and not understanding why the game crashes when they try to load up 50 different decks with varying amounts of cards on them. Once you upload all your templates, then you can separate them out into their proper decks and save your files. Custom decks can be any aspect ratio. The game just cuts whatever image you supply into the grid you choose. 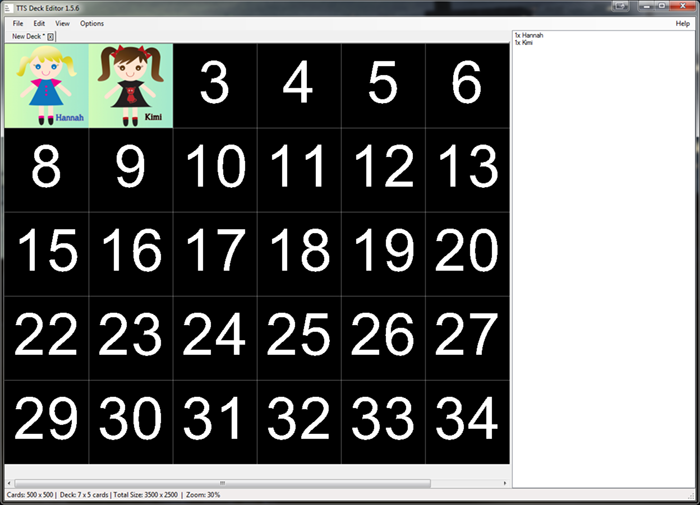 You can upload different size templates, anywhere from 2×2 up to 10×7. This is great for when you are only uploading a smaller amount of cards and want higher resolution, yet save on bandwidth since you aren’t importing a giant sheet with empty spaces. Recommended template size is 4096×4096. There are two different deck editors you can use. Both are located in your Modding folder. The first one is the main one since it’s constantly updated and offers a lot more features. This is the recommended choice. This one is only available in Windows builds, however Mac and Linux users can still download it here. Once we know it consistently works on both Mac & Linux, then we will add the editor to those systems as well. The Deck Editor was created by Froghut. — To get started, just click on New Deck if you’re creating a new deck or Open Deck if you’re working on an existing one. Alternatively, you can click on File and go through the different options there to create a deck. 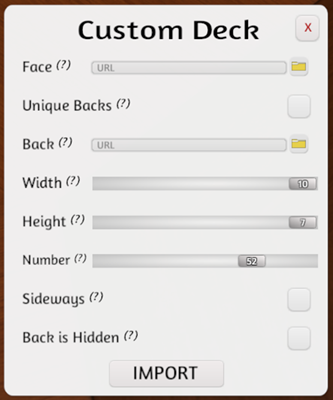 — Choose your deck size width/height. Remember to fill up decks completely regardless of which deck size you choose. — Drag and drop images into your deck. — You can see the names of cards in your deck. — Save your deck in the File drop down menu. — Click on View & go through the different options. — You can upload files directly to a couple different image host sites. — It works with your old .tsdb files if you wanted to switch to this editor from the old Deck Builder. The Deck Builder is an older editor, created by Anwinity and is no longer updated. This is still available in your Modding folder for those who prefer to use this version and is available on all platforms. In the Deck Builder folder under the Old Java Version, click on the TSDB_v2.3.0.jar to open it up. If you think you will run out of memory, then you can click on any of the .bat files to give you extended memory, from 1-8 extra gigs. 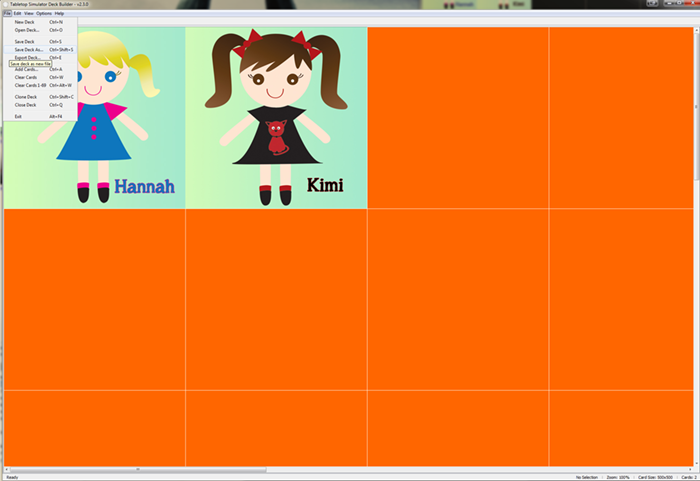 From here you can bring in your individual cards to create a deck template. Just click on ‘File’ and then ‘New Deck’ to get started. This is where you drag your image files over. You can click on ‘Options’ to change your card sizes and background color. If you want a grid around your cards, you can click on ‘View’ -> ‘Show Grid’ or just press CTRL+G. The 70th slot (bottom right) is known as the “hidden” card. So whatever card you put in this slot will be shown when cards are in your hand and viewed to other players other than yourself. Once you have your cards setup how you want, click on ‘File’ -> ‘Save Deck As’ and name it what you want. This is saved as a .TSDB file. Go ahead and make any changes you want. One you are satisfied, click on ‘File’ -> ‘Export Deck’. This is where you can once again change the card sizes and the image width of the entire template. The recommended size is at or below 4096×4096. Click on ‘Export’, name it what you want and where you want it saved and your template has now been created as a JPG file. From here you can go ahead and upload it to your host of choice and add it to Tabletop Simulator when you create your Custom Deck. There are two kinds of Deck Templates in your Modding folder; square cards and rectangle. Both fill up to 69 cards, with the 70th slot (bottom right) being the hidden card. These templates are here for your convenience to help guide you. Just place your card images in each slot in an image editing program, save and either upload to your host of choice or use the file manager in game to import to the Steam Cloud. If you don’t like our templates, feel free to create your own! Just follow the basic info in this guide. Now that you have created your templates, you can import them in Tabletop Simulator. Go to OBJECTS -> COMPONENTS-> CUSTOM -> DECK, fill out the info and press IMPORT. Details on each section is below. Face: This is your 4096×4096 template. Once you create your template, you can either import it using the file browser or input the URL of the file directly. Unique Backs: Check this if you want a different back for each card. Back: Import the back image of your deck. If it’s a unique back, make sure the box above is checked and import the proper template in png or jpg format. 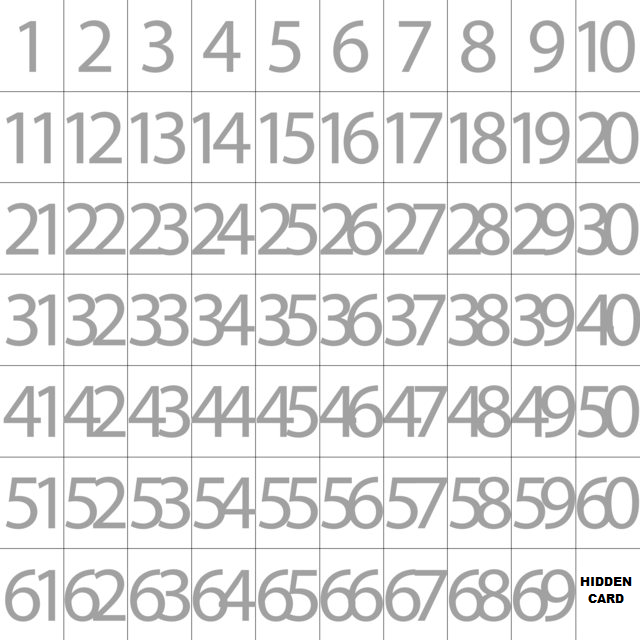 Width/Height: If you use the normal template, it’s 10×7. In these options, you can use a different size template. Smaller templates can also make cards higher resolution. 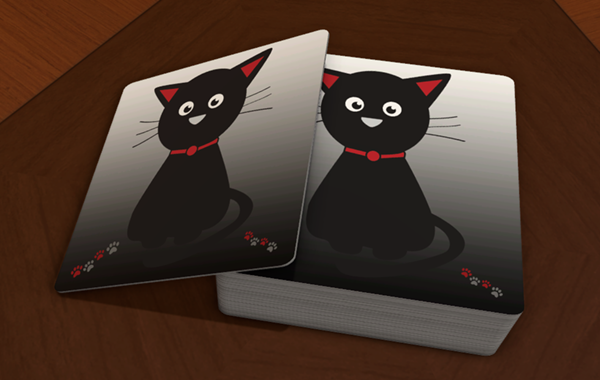 Number: How many cards are in your deck? The max is 70 and the minimum is 2. Sideways: If your deck is horizontal instead of the normal vertical, then check this box. This will affect how the card is viewed when you ALT Zoom. Back is Hidden: If you don’t want to use the 70th slot as the hidden card, check this box. The image you put in the “Back” slot will be shown instead. If you do not check this, whatever card you put in the 70th slot of your template will show up when cards are in the Hand Zones. If you have any questions, please post on our forums for help.